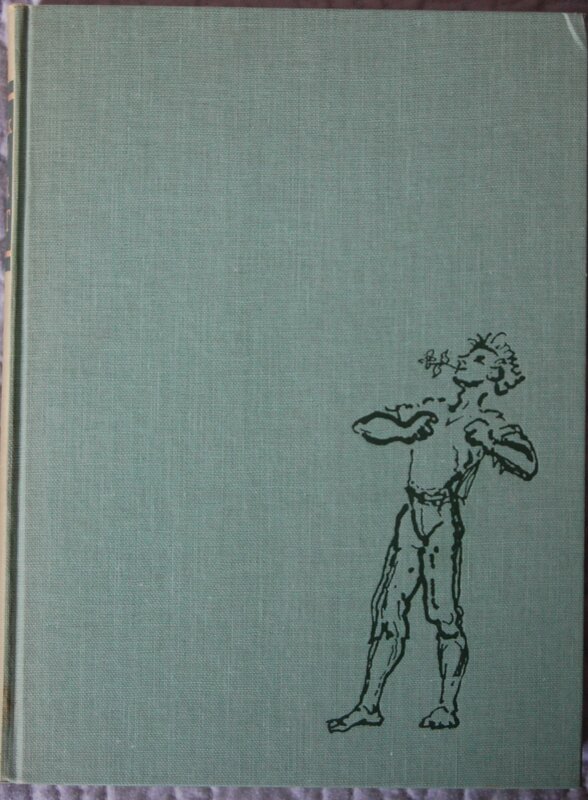 Front Binding – With the coming of our second Ibsen post (see here for the first), this one on his play Peer Gynt, I notice that I was amiss in talking much about Ibsen then. I’ll need to rectify that with an updated post. Why not here? Well, there’s a hugely fascinating story behind this book’s creation that will take some time to tell, and I tend to like introducing authors when I first talk about them. Ah, if I wasn’t so busy with university work (and slacking off on it… XD ). Anyway! The story. This book is the result of World War II. The book’s designer, Harald Grieg, was one of the many prisoners taken by the Nazis when they invaded Norway. It was not because he was Jewish – as far as I know, that was not the case with Grieg. He was Managing Director of Gyldendal, the largest publisher in Norway, and the Nazis were utilizing their presses to create propaganda materials for their cause. When the board of Nationaltheatret, which Grieg was a board member of, declined being subordinated by the Nazi Ministry of Culture and Enlightenment, Grieg and other members of the board were arrested and sentenced to a similar fate of many Jews in Europe – being taken to a concentration camp. It so happened that Per Krohg, this book’s illustrator (and “the most famous artist of Norway” at that time if the Sandglass is to be taken at face value), was also interred into the same camp as Grieg and the two were able to meet in these dire circumstances. To pass away time, Krohg would doodle scenes fromPeer Gynton the walls of his cell. 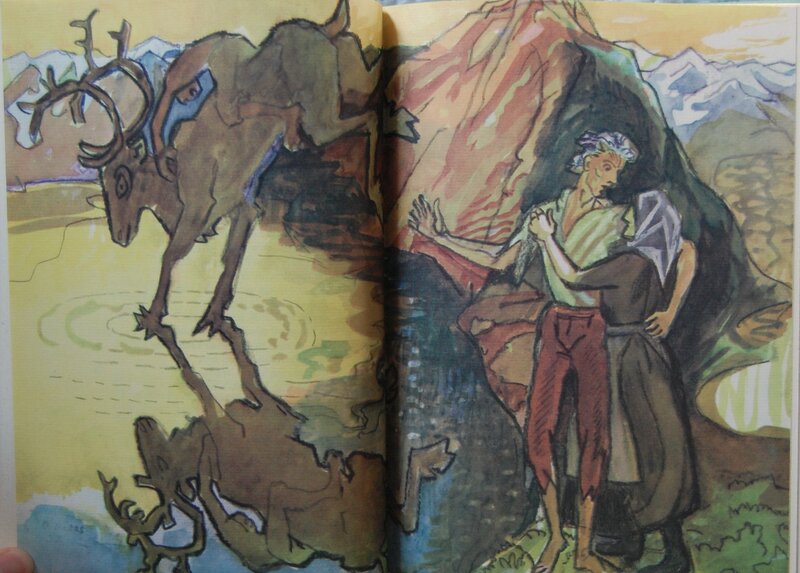 As of the Sandglass, the murals Krohg created were still visible, and the two men would often visit the site and vow to each other to make a book out of these illustrations. Grieg went back into the publishing world and became a publisher himself, managing the presses of Gyldendal and serving as president of the Norwegian Publishers Association. Hedrik Ibsen’s work was under his publishing house, and he had always wanted to produce that special “fine” edition ofPeer Gyntwith Krohg’s powerful art backing it. Enter George Macy in 1951. Macy talked to Grieg and Krohg and got the ball rolling for making that dream a reality. 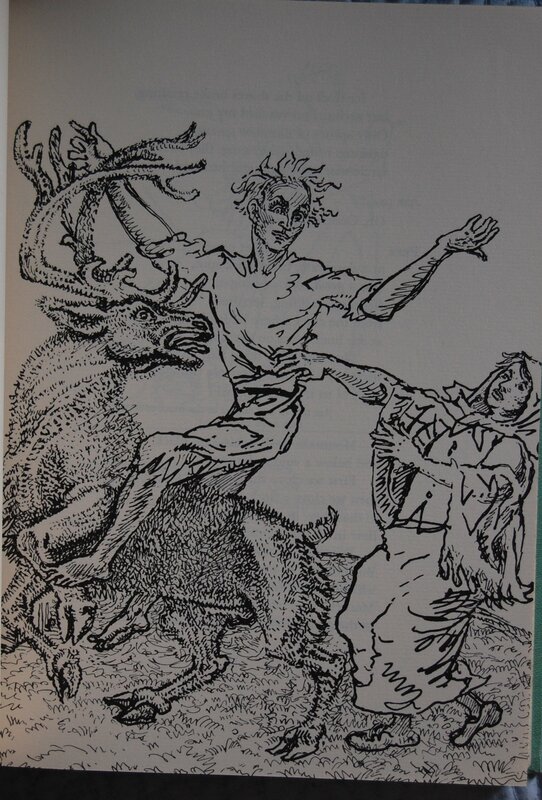 Krohg was then engaged in other work, but once it was completed, the two men who were victims of a horrendous period of history were granted their one solace from that dark period, the publication of Peer Gynt for the Limited Editions Club in 1955, designed by Grieg and illustrated by Krohg. The Heritage edition took a little longer to come to fruition, perhaps due to the death of Macy in 1956. It has a publication date of 1957. As a sidenote, World War II tends to be a major factor in a few books done by the Company – Oedipus the King was deeply affected and significantly delayed by the war, arriving well after its intended due date thanks to the chaos the Nazis ravaged on Greece. Let’s jump into the book perimeters for a moment. Grieg handled the overall design, but assigned the typography to a relative of his, Robert Grieg Gran. 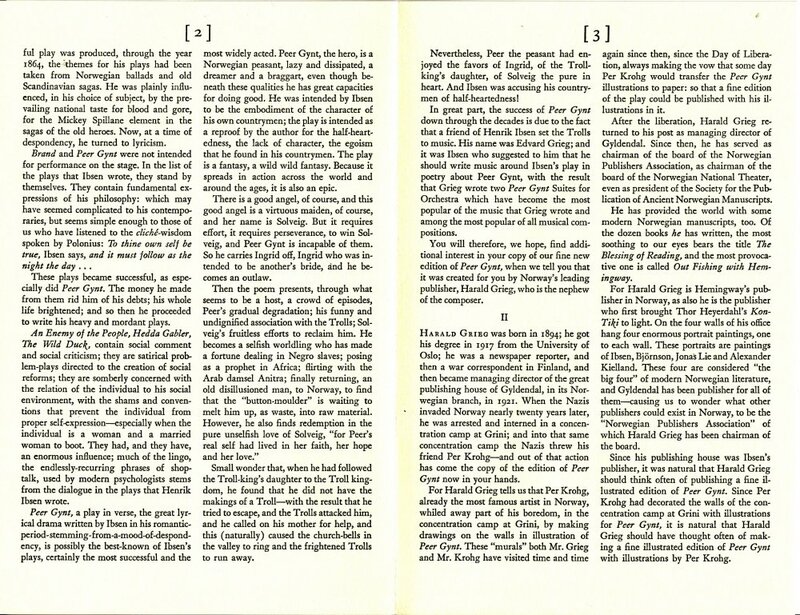 Baskerville was the font choice, and the Centraltrykkeriet of Oslo, Norway printed the LEC edition. Kellogg and Bulkeley of Hartford, Connecticut reproduced the text and illustrations for the Heritage printing on International Paper Company’s Ticonderoga paper. 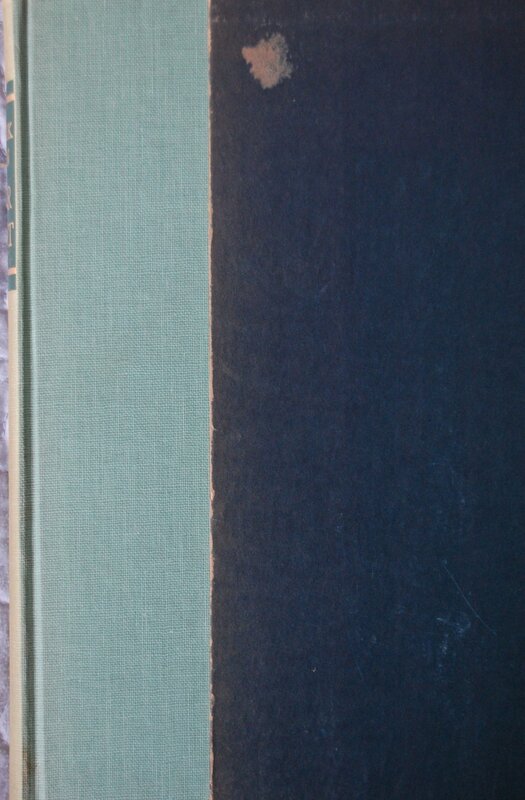 The binding credits are notably absent beyond the mention of green linen covering the boards. 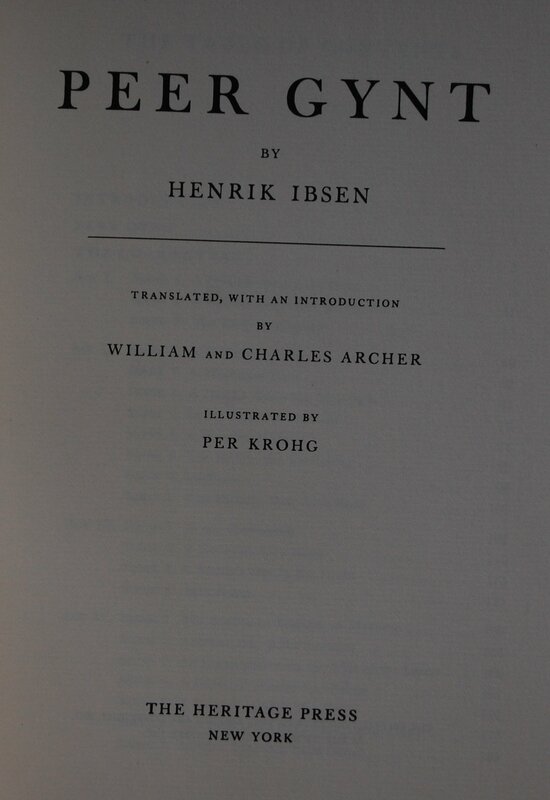 Title Page – William Archer would revisit Ibsen with the later collection of Ibsen’s other plays – here he is joined by Charles Archer on translation and introductory duties. 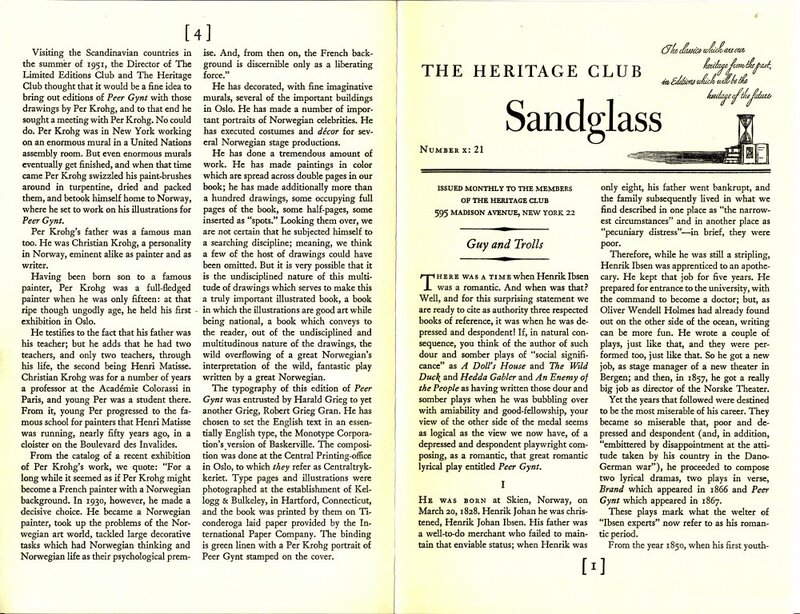 Krohg would only do this sole book for the George Macy Company, but you can read up on his career in the Sandglass. He did a fine job for this particular book, with over a hundred drawings of various sizes AND several double-paged paintings. No shortage of visual treats here. Page 7 – An example of the drawings above and below (some are really sketchy compared to these examples, mind). Page 16-17 – And here’s one of the paintings. Krohg has a style that’s his alone. I wonder how vindicated he must have felt getting this assignment completed. To have his and Grieg’s goal accomplished. You can see the results all throughout the book, and it truly is a special title in the Macy canon. Thanks to skyschaker @ Librarything for bringing Harald Grieg’s biography to my attention, allowing me to modify my post to make it much more factual. 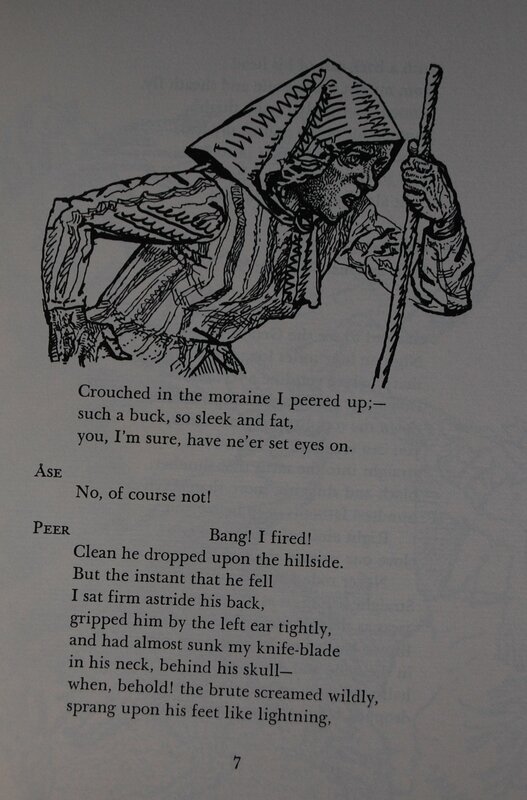 You are currently reading Heritage Press – Peer Gynt by Henrik Ibsen (1957) at The George Macy Imagery.